This parashah covers Exodus 21:1 – 24:18 and goes over 53 Mishpatim or “judgements” in how to be accountable to our fellow man as well as the laws of compensation and restitution when one does something wrong or negligent. In this study we focus on how God intends for us to grow spiritually further than the “basic” instruction in Torah on how to “not do wrong things” to showing selfless love to God and our fellow man on a higher spiritual application in thought, word and deed! Mishpatim (מִּשְׁפָּטִים‎) — Hebrew for interpersonal judgments, is the eighteenth weekly Torah portion and the sixth in the Book of Exodus. The parashah sets out a series of laws, which some scholars call the Covenant Code, and reports the people’s acceptance of the covenant with God. 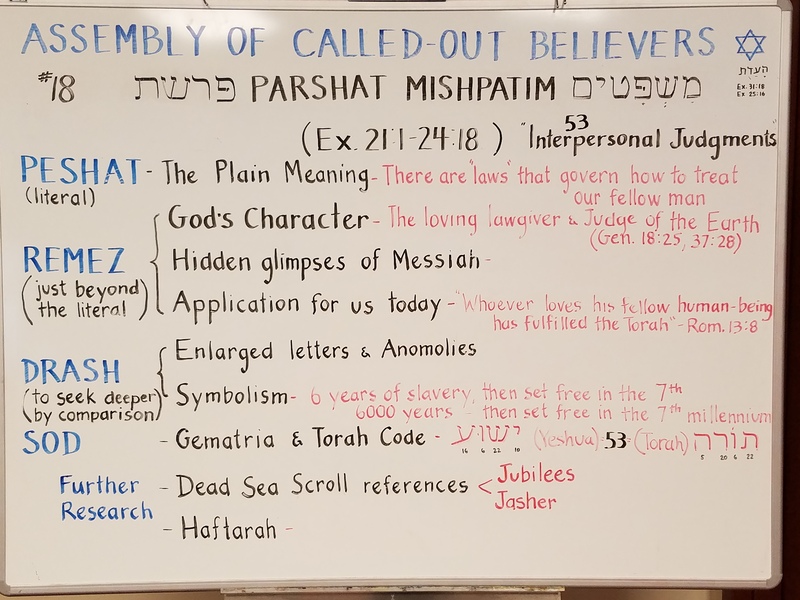 The parashah constitutes Exodus 21:1–24:18..
Mishpatim whiteboard – In this study we realize the depth of the loving lawgiver in giving us instruction in how to rightly live out a loving life with our fellow man! Following the revelation at Sinai, God legislates a series of laws for the people of Israel. These include the laws of the indentured servant; the penalties for murder, kidnapping, assault and theft; civil laws pertaining to redress of damages, the granting of loans and the responsibilities of the “Four Guardians”; and the rules governing the conduct of justice by courts of law. God promises to bring the people of Israel to the Holy Land, and warns them against assuming the pagan ways of its current inhabitants. The people of Israel proclaim, “We will do and we will hear all that God commands us.” Leaving Aaron and Hur in charge in the Israelite camp, Moses ascends Mount Sinai and remains there for forty days and forty nights to receive the Torah from G-d. In this week’s haftorah, Jeremiah describes the punishment that would befall the Jews because they continued enslaving their Hebrew slaves after six years of service—transgressing the commandment discussed in the beginning of this week’s Torah reading. King Zedekiah made a pact with the people according to which they would all release their Jewish slaves after six years of service—as commanded in the Torah. Shortly thereafter, the Jews reneged on this pact and forced their freed slaves to re-enter into service. God then dispatched Jeremiah with a message of rebuke: “Therefore, so says the Lord: You have not hearkened to Me to proclaim freedom, every one to his brother and every one to his neighbor; behold I proclaim freedom to you, says the Lord, to the sword, to the pestilence, and to the famine, and I will make you an object of horror to all the kingdoms of the earth.” The haftorah then vividly depicts the destruction and devastation that the Jews would experience.